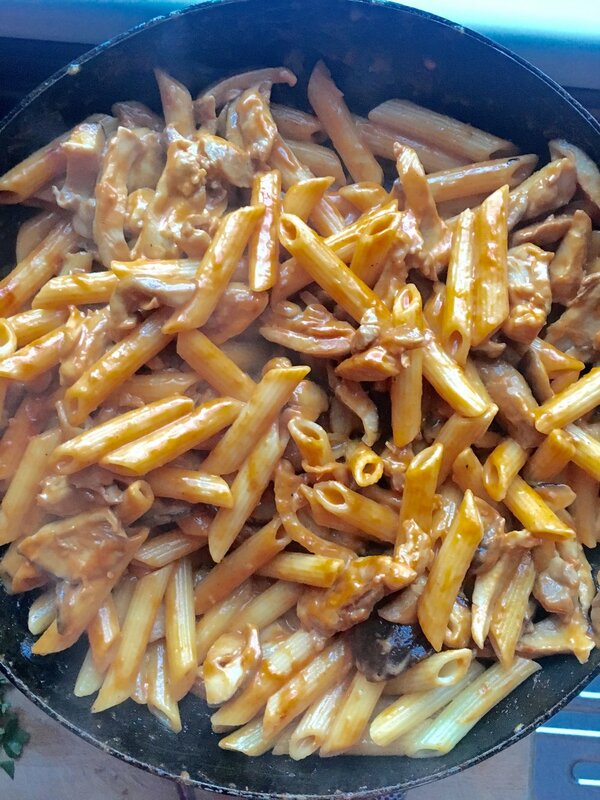 Not much of an introduction for this one; If you like creamy pasta, chilli and chicken it's the business and can be cooked in around 15 minutes. First boil the water for the pasta and add three tablespoons of salt. It sounds a lot but you won't be eating all of it. Throw in the pasta and cook as per packet instructions less 1 minute. Chop your chicken into strips and put a large pan on the heat. Allow the pan to get up to temp and add the oil and half the chicken. If you add all the chicken at once too much heat will be lost from the pan and the chicken will braise and steam rather than fry. You want to colour the chicken which will give better flavour. I used chicken thighs as they produce a richer taste but if, like my wife, you prefer breast it would be a less worthy alternative but fine non the less. Remove the first half of the chicken and fry the second half for around 3 minutes as per the first. When they reach a golden colour add the first batch of chicken back to the pan along with the shiitakes and garlic. Fry for a further 5 minutes until the mushrooms have softened and the chicken is cooked through. Now it's just a case of making the sauce. After 10/11 mins your pasta should be just under al dente. 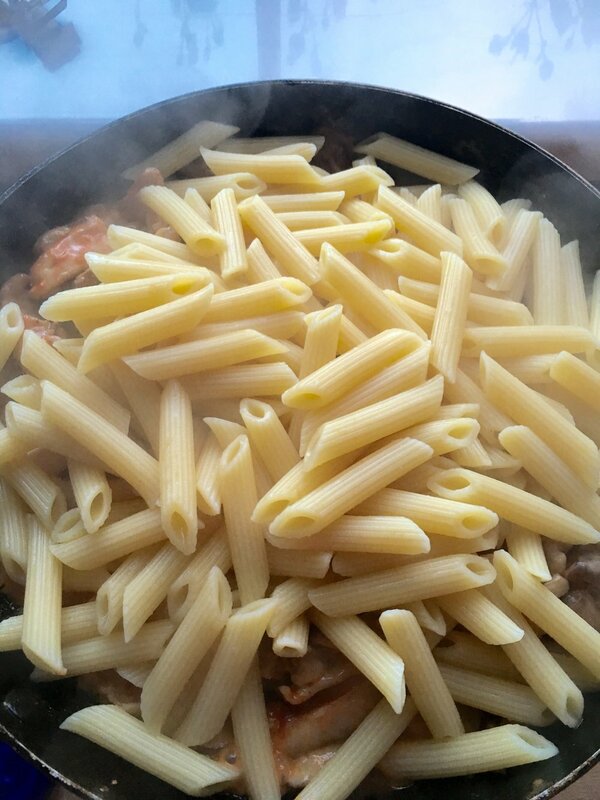 You want to undertook the pasta as it will continue to cook in the sauce. Add the pasta to the pan along with the chilli sauce, cream, juice of half a lemon and the smoked paprika. Mix well and move the pan to a smaller ring and continue to cook and stir for a further 3 minutes. You want the sauce to reduce enough so that it coats the pasta. After 3 minutes it should be al dente and when you hear the pan start to crackle that means there is no excess sauce in the pan and you know it's done. Ensure you serve on a warm plate or bowl and garnish with basil which adds an excellent fresh finish to the dish.